Tick bites can range from mild nuisance to serious medical condition. And while most tick bites are harmless, on rare occasions, tick bites can transmit serious illnesses like Lyme disease, Rocky Mountain spotted fever, Colorado tick fever, relapsing fever, tularemia, ehrlichiosis, babesiosis (and even more in pets). Ticks can stay attached to their host for days, even weeks, after the initial bite. The longer a tick stays attached to you or your pet, the higher the chances are of contracting an illness or other infection (ticks removed within 36 hours rarely cause disease or infection.) In other words, if you or your pet gets bitten by a tick, you need to remove it as soon as possible. The best, non-toxic way to handle ticks is to keep them away from your home, pets, and family with our all-natural cedar-based Yard Guard. Yard guard not only discourages fleas and ticks from coming near your lawn, but will kill any existing infestation, including un-hatched eggs. 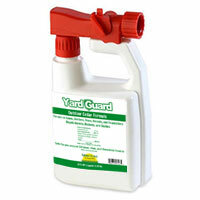 Yard Guard will also keep mosquitoes, ants, and spiders at bay! Hiking, camping, dog-walking-any outdoor activity, especially those in or around tall grass, can leave you the host of a tick. It’s important to check both yourself and your pet for ticks after engaging in any activity that might have exposed you to these parasites. Ranging from the size of a pinhead to 2/3 of an inch, ticks can be brown or red, even white and blue-green (especially after feeding). Ticks can easily go unnoticed, so when checking for ticks, it’s crucial to take your time and be thorough. Pay close attention to these areas: armpits, ears, belly button, scalp, around the waist, back of knees, crotch, thighs, and in between toes and fingers. As mentioned above, ticks carry various infectious diseases. When removing a tick, it’s not uncommon (though it should be avoided) for the parasite to become damaged, spilling blood and other fluids in the process. To avoid having these potentially hazardous fluids seep into a crack or sore in the skin, it’s best to be cautious and always use gloves when handling or removing a tick. Using pointed tweezers, grab the tick as close to the skin surface as possible; this usually means grabbing the tick by its mouthparts. Avoid squeezing or damaging the tick in any way—when harmed or irritated, ticks can expel infectious bodily fluids into the bloodstream of their hosts. Slowly and carefully pull directly upward. Do not twist or yank the tick. With steady pressure, you should be able to remove the entire tick intact. If the tick’s mouthparts break off in the skin, attempt to carefully remove them. If this cannot be done easily, stop trying and leave them inside. Monitor the site and consult a medical professional if you spot any signs of infection. After removal, thoroughly clean and disinfect the bite site with soap & water or rubbing alcohol. Place the removed tick in a ziplock bag; it will eventually suffocate and die. You may wish to save the tick for up to two weeks—in the event you or your pet begin showing signs of illness, you may want to have the tick identified or tested for disease by a professional. Over the next two weeks, observe the bite site for any signs of disease or infection, like rashes, swelling, tenderness or redness. Consult a medical professional if such signs occur. If you begin experiencing flu-like symptoms shortly after removing a tick (3-14 days), consult a medical professional immediately. That’s all for now! As always, feel free to email us with questions about our products at info@natureslawn.com .